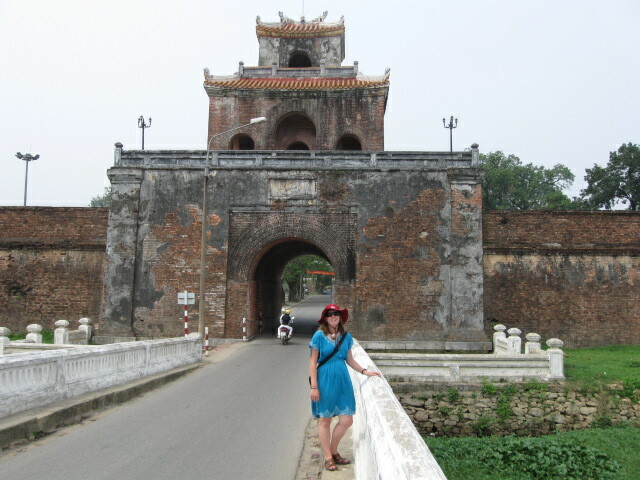 We made it to the ancient imperial city of Hue. 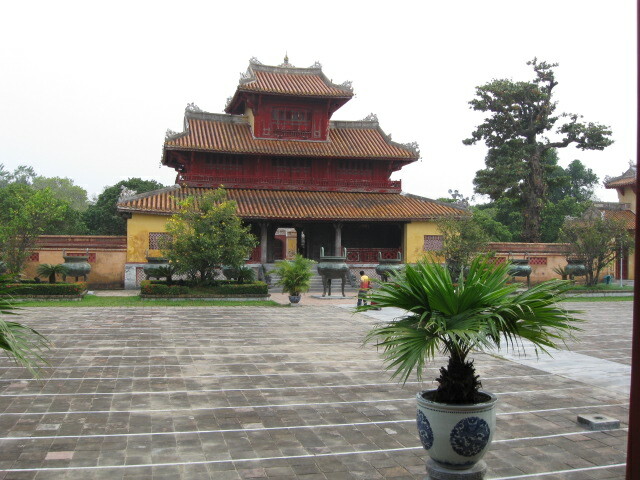 The city contains is a big citadel and a run-down forbidden city that housed the former royalty of Vietnam. 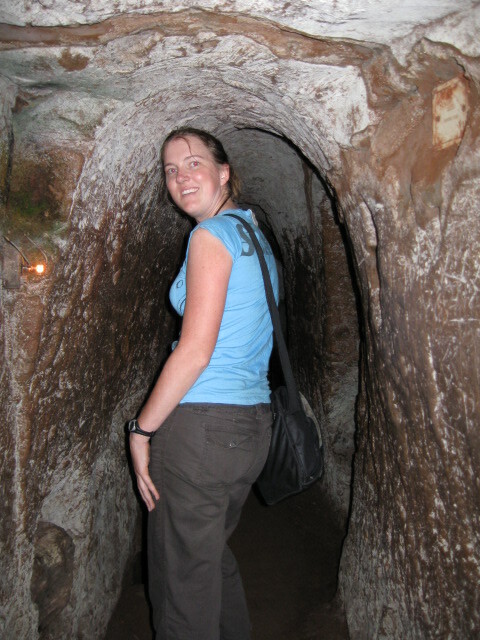 We also visited tomb complexes for the royals and puttered around the countryside on a scooter. Hue is also near the former “demilitarized zone” (DMZ) from the war with America (as opposed to the previous wars with the French, Japanese, and Chinese) . 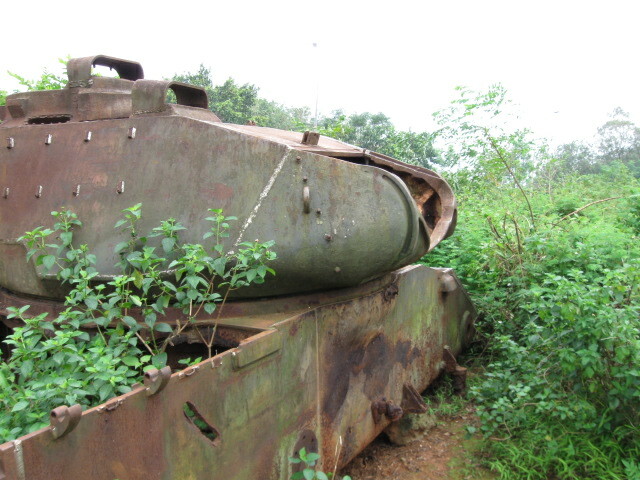 Contrary to the name “Demilitarized Zone”, this area had a heavy concentration of weaponry and saw the heaviest fighting during the conflict with American forces and contains many historical sites associated with the American phase of the war here. Aside from the more commonly known American involvement in Vietnam, the Vietnamese had been at war with many people for a very long time prior to our war in Vietnam. The Chinese have meddled in their country for centuries, and the national hero Tran Hung Dao is famous for defeating the Chinese emperor Kublai Khan in the battle of Bach Dang river near Halong Bay. 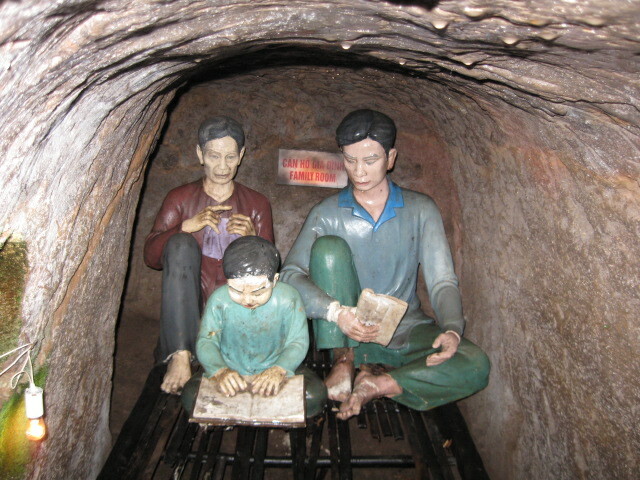 The Vietnamese, led by Tran Hung Dao, hid bamboo poles spiked with iron in the caves in Halong Bay, and later used them to set a trap for the Chinese warships in the shallows of the Bach Dang river. The Chinese invaders were lured into the trap, and as the tide receded their warships were impaled on the spikes in the shallow river. Next in line where the colonial French who occupied the country until World War II. As France fell to the Axis alliance, the French colonial government in Vietnam cooperated with the Japanese as they occupied the country. At this time, Ho Chi Minh was a prominent figure the Viet Minh (League for the Independence of Vietnam) in their struggle for independence from the French and Japanese. It is interesting to note that the American OSS (Office of Strategic Services) worked closely with Ho Chi Minh (born Nguyen Sinh Cung) during World War II, with the Viet Minh helping rescue downed US pilots and providing information to the Americans on Japanese troop movements. The American OSS “Deer Team” even helped treat Ho Chi Minh’s dysentery and malaria during this time. At the end of WWI, the French wanted to reclaim their colony of Vietnam. The Viet Minh wanted independence. Ironically, Ho Chi Minh borrowed heavily from the U.S. Constitution when he declared independence from France as he is reported to have declared: “All men are born equal. The Creator has given us inviolable rights: life, liberty, and happiness!” An article by an instructor at the United States Naval Academy, Claude Berube, provides an interesting insight into the complex early relationship between the Americans and Ho Chi Minh before we began to fight against him. After World War II, the French portion of the war (before American involvement) really occurred in the northern portion of the country. The battle at Dien Bien Phu (1954) near the northern city of the same name, near Sapa, was a critical battle in which the French were defeated by the Viet Minh during the “First Indochina War”, 1946-1954. With the defeat of the French in 1954, the country was partitioned and election scheduled for the entire country in 1956. The election was never held, since the South Vietnamese and the Americans feared that Ho Chi Minh and his communist faction would win. In the Cold War climate, the WWII era alliance between Ho Chi Minh and the Americans was over and the conflict began to escalate to the detriment of the Vietnamese people. The communist north became increasingly totalitarian and the entire country was embroiled in a long guerrilla war. 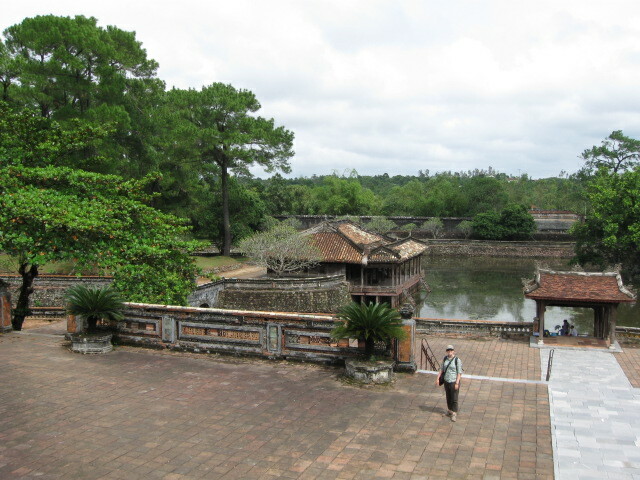 The DMZ area around Hue was a major battleground during the 1960s and 1970s. Tours to visit the DMZ is now thriving business in Hue now, with itineraries to Khe Sanh, Vang Ley, Camp Carroll, Ben Hai River, Hien Luong Bridge and the Vinh Moc Tunnels (among many other locations). The entire region is still full of unexploded ordnance (UXO- such as mines, old bombs that failed to detonate, old grenades, etc.) so it is best to go with a guide. International de-mining groups continue to work in the area to remove the UXO, as farmers and children still suffer from horrible injuries from remnant UXO left scattered around the countryside from the conflict. 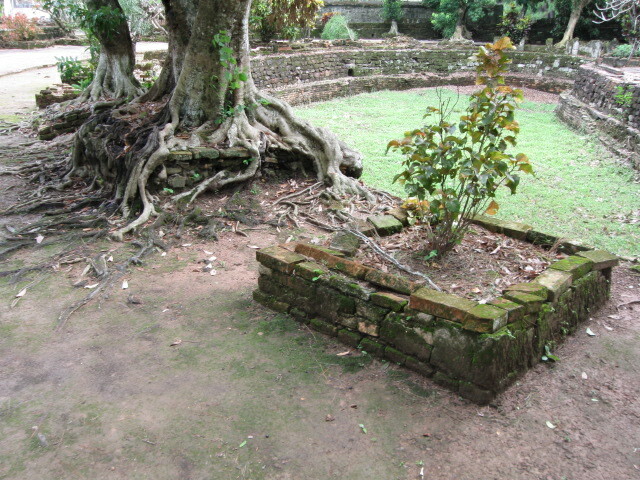 Some of the tours can last all day, but as many of the sites are overgrown or have been replanted as rubber or pepper plantations, there is not as much to see. 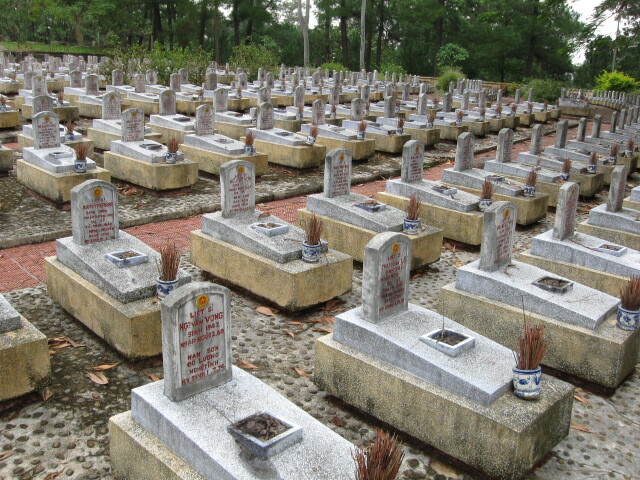 We opted for a short tour starting in Dong Ha, traveling to the old Doc Mieu Base (not much left to see and too dangerous to walk around), to the Truong Son National Cemetery and the Vinh Moc Tunnels. Vinh Moc was a fishing village just north of the DMZ that was so heavily bombed that the 300 or so villagers moved underground, coming out to fish during the night-time. In total, the U.S. dropped about 6.7 million tons of bombs on Vietnam, twice the total of the 2.7 million tons of Allied bombs dropped in Europe during WWII. Another 2.7 million tons of bombs were dropped on Cambodia in an effort to cut Vietnamese supply lines. Yet, as the Vietnamese people here often ask us where we are from and we reply “America”, they consistently respond with: America!? !, Very Good!!!! Two city planners ride out the economic downturn by traveling around the world.